To review some sample pages of the disk click here. To United States Shipping and Handling is $3.00. Use the button below to purchase. To Canada Shipping and Handling is $8.00. Use the button below to purchase. To the world Outside of North America and Hawaii shipping and Handling is $10.00. Use the button below to purchase. This disk is the first English Language guide covering these trains. While in no way a complete guide to any of these manufacturers this is a good starting point. Below are some features of the disk. This menu driven, self starting CD requires virtually no computer skills. Simply insert the CD into the CD-ROM drive in your computer and wait for it to start. It has 124 pages showing 45 sets and 170 individual items. There are more than 850 color photographs. Many boxes are shown and logos identified. Photographs of each item including many detail shots. Written description of each item. 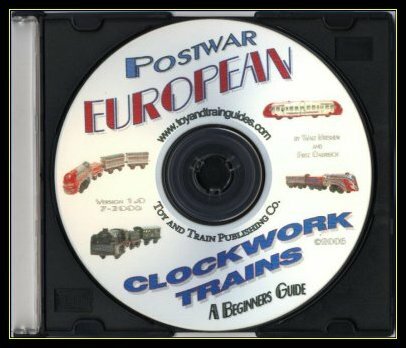 If you love these little toy trains that have been largely overlooked by the train collecting community this CD is for you. It does not promise to show everything you might have but it is a good starting point for the identification and evaluation of these trains. You are likely to be able to identify other items in your collection by comparing eccentric rods, bodies, couplers, boxes, etc.